What is a Best Buy? Should I Buy an Extended Warranty? Should I Buy a Certified Pre-Owned (CPO) Vehicle? What is the Doc Fee? 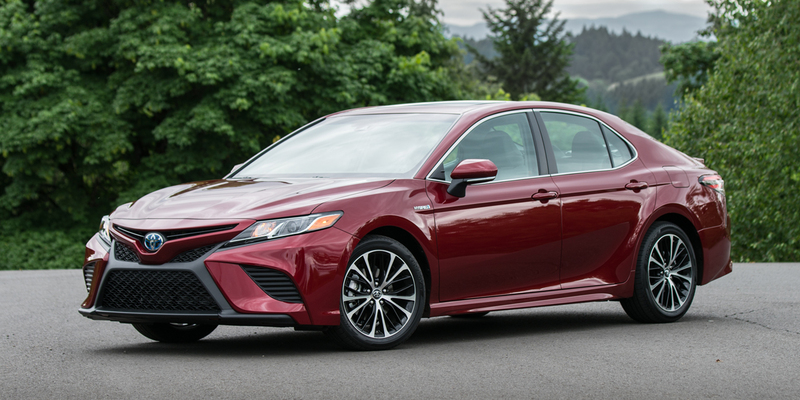 CG Says: The 2019 Toyota Camry is essentially unchanged following last year’s redesign. The Toyota Camry model lineup ascends through the entry-level L, LE, SE, XLE, and XSE; the Camry Hybrid is offered in LE, SE, and XLE trim. Standard on all is Toyota’s Safety Sense-P, a suite of high-tech items that includes forward collision warning and mitigation with pedestrian detection, lane-departure warning and mitigation, automatic high beams, and adaptive cruise control. Three powertrains are offered. Output of the base 2.5-liter four-cylinder engine is 203 horsepower (206 in the XSE), while the 3.5-liter V6 has 301 hp. Both engines are paired with an 8-speed automatic transmission. The Hybrid combines a 2.5-liter four-cylinder gas engine with an electric motor for a combined 208 hp and comes standard with a CVT automatic transmission. Available features include a head-up instrument display, 360-degree camera, LED headlights, blind-spot alert, rear cross-traffic alert, and a brake-hold feature. The redesigned Toyota Camry retains the sensible-shoes virtues that have long been its trademark, but adds a level of design flair and dynamic appeal that will likely cause traditional family-sedan buyers to do a double take. A fine selection of trim levels and powertrains allows the Camry to be tailored to a wide range of shopper wants and needs. For complete ratings click here. For nearly 50 years, car shoppers have been relying on Consumer Guide Automotive. Our editors test drive and thoroughly evaluate virtually every new car, truck, minivan, and SUV sold in America.